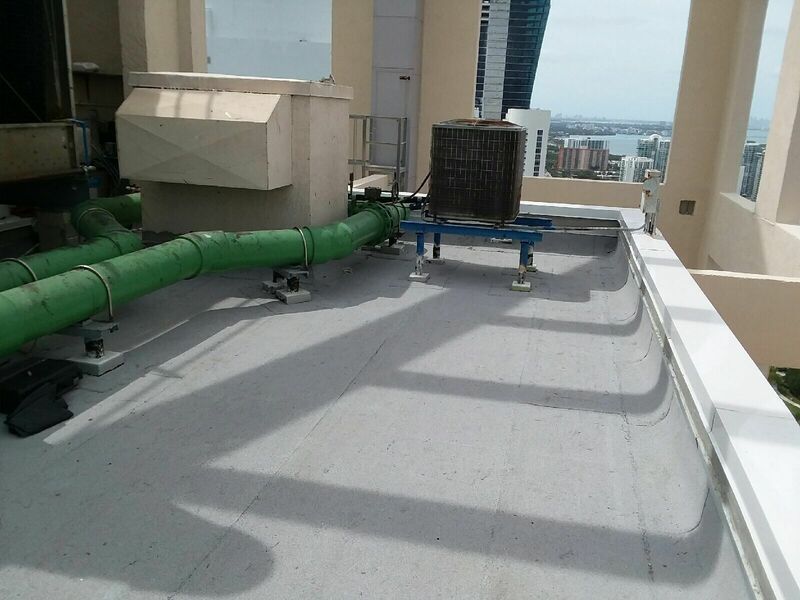 The elegant Pinnacle Condominium in Sunny Isles Beach, just off of Collins Avenue, contacted Perkins Roofing Corp. for its much-needed air conditioning cooling tower re-roof project. The four a/c towers, located at the top of the 34-story condo building, each underwent a successful re-roof including be treated with a Polyglass® self-adhered modified system. A 10-year Perkins Roofing warranty was also applied to this Sunny Isles a/c tower re-roof project. Unique challenges faced by the Perkins Roofing technicians include high winds, as this condo is 34 stories tall and is located off of the Atlantic Ocean, tight and confined spaces where roof tear-off and product application was performed, all roofing materials were transported via elevator, and multiple layers of roof and insulation had to be removed in order to construct the new, healthy roof.